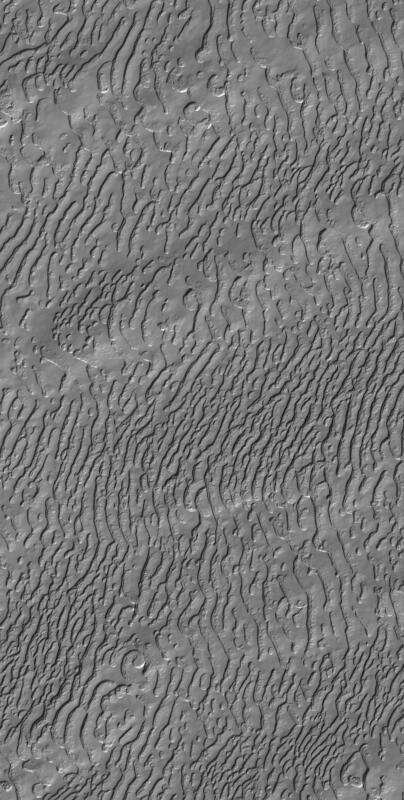 This Mars Global Surveyor (MGS) Mars Orbiter Camera (MOC) image shows a south polar residual cap landscape, formed in frozen carbon dioxide. There is no place on Earth that one can go to visit a landscape covering thousands of square kilometers with frozen carbon dioxide, so mesas, pits, and other landforms of the martian south polar region are as alien as they are beautiful. The scarps of the south polar region are known from thousands of other MGS MOC images to retreat at a rate of about 3 meters (~3 yards) per martian year, indiating that slowly, over the course of the MGS mission, the amount of carbon dioxide in the martian atmosphere has probably been increasing.